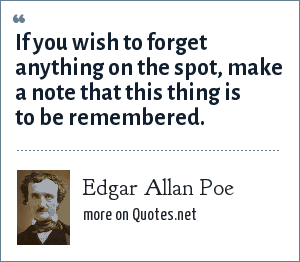 Edgar Allan Poe: If you wish to forget anything on the spot, make a note that this thing is to be remembered. "Edgar Allan Poe Quotes." Quotes.net. STANDS4 LLC, 2019. Web. 23 Apr. 2019. <https://www.quotes.net/quote/49903>.